Tudor portraiture is notorious in leading to frequently incorrect identifications of sitters who were almost certainly not the sitter actually painted. Yet portraiture is highly influential in our interpretations of these supposed sitters' lives, careers, choices, and actions. Drawing upon four specific case studies here, this article considers why and how Tudor portraits are incorrectly identified, and how these incorrect identifications inform our interpretations of Tudor personages. A portrait of Mary, Lady Dacre and her son Gregory; often mislabelled as Frances Brandon, duchess of Suffolk and the mother of the 'Nine Days Queen' Lady Jane Grey, and her second husband Adrian Stokes. This portrait has proved fundamental in leading to misguided views of Frances as being a cruel woman who bullied her daughter, due to the sitter's fierce characteristics. This article begins with Frances Brandon (1517-1559), duchess of Suffolk by right of her marriage in 1533 to Henry Grey, marquis of Dorset and later Duke of Suffolk, niece of Henry VIII, king of England, and mother of Jane Grey, later queen of England (c.1537-1554). Frances lived a remarkable life, yet her reputation has been slandered over the course of history due to the view of her being a cruel, spiteful woman who frequently bullied her daughter Jane, often violently, which is still conveyed in modern works (Alison Weir's fictional Innocent Traitor often portrays Frances violently hurting Jane both physically and psychologically). This myth occurred at the beginning of the eighteenth century, acting in parallel with the depiction of Jane Grey as a Protestant martyr who died for her religion at only seventeen years old, executed on the orders of a vengeful queen, her own cousin Mary I. "For when I am in presence of either Father or Mother, whether I speak, keep silence, sit, stand or go, eat, drink, be merry or sad, be sewing, playing, dancing or doing anything else, I must do it, as it were, in such weight, measure and number, even so perfectly as God made the world, or else I am so sharply taunted, so cruelly threatened, yea, presently sometimes with pinches, nips and bobs, and other ways, (which I shall not name, for the honour I bear them), so without measure misordered, that I think myself in hell". This passage, of course, needs to be viewed critically, particularly because this passage was only recorded much later after the actual events, and Jane's tutor Ascham actually praised her parents in an earlier letter. Furthermore, since the Victorian period, a more balanced appreciation of the character of Lady Jane Grey has developed. Rather than viewing her as a perfect child martyr, innocent and passive, as the Victorians did, historians have regarded her more critically, and while recognising her intelligence and determination, have also suggested that she was a proud, stubborn, narrow-minded, even arrogant young woman. Frances, conversely, in contemporary sources was noted for her goodness and kindness to friends. We can therefore see how an incorrect identification of a sitter in a Tudor portrait can develop or intensify myths and legends surrounding that personage. Because Lady Dacre is depicted as unfriendly, cold, even ruthless, this was deployed by those who believed that it was actually a portrait of Frances, duchess of Suffolk to present her as a domineering woman who was prone to physical violence. This myth needs to be recognised for what it is: a myth. Left: Katherine Howard, Elizabeth Seymour, or another Tudor woman? For centuries, controversy has raged as to who this sitter is. Right: Angela Pleasance as Katherine Howard in The Six Wives of Henry VIII (1970). No less important than the portrait of 'Frances Brandon' in informing interpretations of Tudor personalities is that of a portrait supposedly depicting Katherine Howard, queen of England. Identified as being the tragic queen c. 1898 and furthered by the renowned biography of the queen by Lacey Baldwin Smith (1961), this portrait has widely been used to put forward arguments surrounding Katherine's birth date, thus influencing our views surrounding her childhood, her personality, and the nature of her sexual relationships. Baldwin Smith arguably used this portrait to support his view of Katherine as 'a juvenile delinquent'. Recently, the identification of this sitter as Queen Katherine has been challenged, notably by Lady Antonia Fraser in her biography of the six wives of Henry VIII (1992). She identified this portrait as actually depicting Elizabeth Seymour nee Cromwell, younger sister of Queen Jane Seymour; strengthened by the fact that this portrait was housed in the collection of the Cromwell family. While agreeing with Fraser that this portrait is not Katherine, in view of the fact that it does not match up either with notions of the queen's age or her physical appearance, I disagree that it represents Elizabeth Seymour. There are several reasons for this. Firstly, as has been recognised, at least three versions of this portrait exist. The sitter was therefore far more important than the daughter of a knight, as Elizabeth was. Whoever this woman was was clearly of noble, if not royal, rank. Secondly, we do not know when Elizabeth was born, but if it was around c.1511, as has been suggested, the sitter cannot be her, because this portrait dates to the mid to late 1530s or the early 1540s, when Elizabeth was likely in her mid twenties, not aged 21, as the sitter's age is. As Janet M. Torpy stated, "a necklace, rings, a brooch bearing the Biblical story of Lot, lace, and golden embroidery all signify extreme wealth and the appropriate piety and purity". It is entirely likely that this portrait actually depicts another royal woman, of which there are no less than four possible candidates in this period: the king's daughter Mary Tudor (aged 21 in 1537), Lady Margaret Douglas, his niece (aged 21 in 1536), or either of the king's Brandon nieces, Frances (aged 21 in 1538) or Eleanor (aged 21 in 1540). But this portrait, like the one thought to be of Frances Brandon, has informed interpretations and representations of Katherine Howard, whom it was commonly thought to portray for a long period of time. In the television series The Six Wives of Henry VIII (1970), as depicted above, Angela Pleasance, in her appearance as Queen Katherine, is clearly shown wearing a costume based on the dress worn by the sitter in this portrait. Her portrayal of Katherine is as a hedonist teenager who selfishly manipulates Thomas Culpeper to impregnate her, while she is seen to use physical violence against her cousin and is given to hysteria. This portrait was fundamental in Baldwin Smith's interpretation of Katherine as an older, knowing girl who firmly held the upper hand in her relationships and was prone to manipulating her lovers. Yet as my research has indicated, she was probably somewhat younger than this portrait suggests. This portrait has also led to historians suggesting that Katherine was not as beautiful as legend indicated that she was. This can be refuted, since there are at least three contemporary statements which suggest that the queen was uncommonly attractive; one Spanish citizen gushingly stated that she was the most beautiful woman 'in the kingdom'. This does not support the notion that the woman in this portrait is of the queen. Left: a portrait inscribed as being Anne Boleyn, 1530s. Right: unknown woman. Identified as being Anne Boleyn by Roy Strong, yet others have identified this woman as being another of Henry VIII's queens, either Katherine of Aragon or Jane Seymour. Alison Weir suggests convincingly that it shows Mary Boleyn, Anne's sister. Thus we can strongly see that portraiture is highly influential in guiding assessments and interpretations of Tudor personages. It seems unsurprising, therefore, that this is arguably best illustrated with the case of Anne Boleyn. The two portraits above have both been identified as showing the second queen of Henry VIII - despite the fact that neither bears any resemblance to contemporary descriptions of the queen. The sitter on the left was identified by noted Tudor historians David Starkey and John Rowlands as a contemporary likeness of Anne Boleyn. This has resulted largely from a hostile account of Anne at her coronation in 1533, which described the queen as having a fat, even disfigured, neck, resulting from a swelling which she then tried to conceal at her coronation. Further problems arise from the fact that this woman is blonde, whereas Anne was, famously, dark. This woman clearly wears a nightrobe, while the somewhat plain, rounded face bears little resemblance to contemporary reports of Anne as being narrow-faced, with high cheekbones. Yet, again, a misidentified portrait has been used to promote interpretations of its supposed sitter. Here the case seems to be that hostile accounts which vilified the queen should be regarded as historically accurate, or at least not as wild in their claims as historians have conventionally supposed. The portrait on the right epitomises the game of 'Guess the Sitter' in Tudor portraiture. To my knowledge, there has been no less than four sitters put forward. Originally identified as being of Henry VIII's first queen, Katherine of Aragon, this was ruled out by the fact that the portrait was painted in c.1525, when Katherine was aged forty, yet the sitter is twenty-five. This also rules out another identification of the sitter as being Jane Seymour, who was twenty-fine in c.1533 and so comes too late after this portrait was painted. Roy Strong, however, suggested that it depicts Queen Anne. There are, again, problems here. The sitter is blonde, while Anne Boleyn did not come to public attention until 1527, when the king proposed marriage to her. In 1525-6 she was a maid of honour to Queen Katherine, and so was not important enough, in a sense, to be painted in a portrait miniature. It is more likely to portray Mary Boleyn, Anne's older sister, who gave birth to a son - possibly the king's - in 1525; if one supports the view that she was born around 1499, this may tentatively be said to present Mary Boleyn. Above: a portrait identified as being Thomas Boleyn, earl of Wiltshire and father of Anne. Recently, however, it has been argued that it actually depicts James Butler, 9th Earl of Ormond. Developing the game of 'guess the sitter', the portrait above has often been cited as a likeness of Thomas Boleyn, Earl of Wiltshire and father of Anne. Indeed, we can see how this has informed interpretations of the earl's physical appearance and supposed resemblance to his daughter Anne, as seen in Joanna Denny's biography of the queen published in 2004. 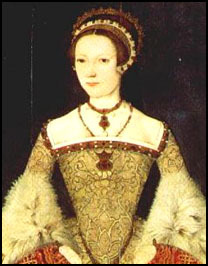 Denny suggests that Anne Boleyn was not dark, as is often believed to be the case, but was actually fair in her complexion, while having auburn, as opposed to black, hair, on the basis of this portrait showing 'striking' similarities between father and daughter. However, this is almost certainly untrue, since historian David Starkey has indicated that it portrays James Butler, not Boleyn. As Starkey notes, there is "an utter dissimilarity between the Windsor drawing [of Boleyn] and Boleyn's superb tomb brass". Once again, we have been deceived as to the real sitter of a Tudor portrait. Above: Lady Jane Grey or Queen Katherine Parr? A portrait above shows a superbly dressed noblewoman, dated to the early-to-mid 1540s. It was initially identified as portraying Lady Jane Grey, England's first queen regnant, in 1965 by Roy Strong. This occurred due to Strong's perception of similarities between this portrait and an engraving of Jane published in 1620. Yet, as Susan E. James has convincingly suggested, the portrait actually portrays Katherine Parr, sixth queen consort of Henry VIII. This seems all the more convincing since Katherine was queen in the period 1543-1547, when this portrait was executed, and since Lady Jane was born in around 1537, she would have been only eight years old, or thereabouts, when this woman sat for the portrait. This is clearly not a portrait of an eight year old girl. The fact that this sitter wears jewellery which other queen consorts of the period, such as Katherine Howard, adorned, indicates that it represents Katherine Parr, who would have obtained this jewellery in her right as queen. Yet, once again, a misidentification of a portrait has influenced judgements about the sitter. Frequently, this portrait is advertised in both written works (ie books) and online as showing the tragic Nine-Day queen. It probably represents her one time great-aunt, Katherine. Tudor portraiture is therefore precarious. Whether one uses it as a source in interpretations or not, it must be carefully scrutinised before making grandiose claims. The game of Guess the Sitter is, unfortunately, a very frequently occurring one in terms of Tudor portraiture, yet it serves to show how mysterious and yet compelling this period continues to remain. This was really an enjoyable and well written article. I truly am looking forward to reading your complete blog. In truth, no one really knows who the sitters are for portraits unless they were there or were the sitters or the artists themselves. Anything else is speculation and informed guess work, unless of course if the portraits themselves were clearly marked and identified by the artist. I am loathe to discuss disturbing the dead, but has anyone considered exhuming some of the subjects and performing some of the forensic anthropological techniques of “building the facial features” from the skulls to get “better” guesses of what these people may have really looked like? Barring the expense and the negative connotations of cracking open graves/tombs long ago sealed, it truly would be an extraordinary forensic study into history.